President Emmanuel Macron attempted Tuesday to rebound from two months of often violent anti-government protests by launching a nationwide debate over the grievances fuelling the "yellow vest" movement. Macron travelled to the northern town of Grand Bourgtheroulde to kickstart what he has billed as a "great national debate", the central plank of his bid to turn around his presidency. The 41-year-old centrist passed a group of yellow vest protesters by the roadside on the way to his meeting with 600 mayors, who relayed the concerns of residents in their towns and villages in the Normandy region. 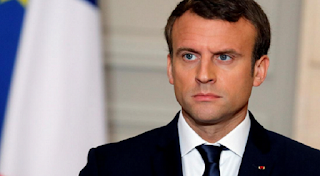 In his opening remarks to the meeting, which was broadcast live on television, Macron promised that "all the questions" raised by citizens would be given consideration. "There can be no taboos," he said in answer to charges that he has sought to limit the debate by taking some issues off the table from the outset. Several mayors spoke of a sense of abandonment by the state in underpopulated rural areas with dwindling public services, and a widening chasm with Paris and other big cities. "We feel as if there is a two-speed France and wonder if we're not in the B category," Jean-Paul Legendre, mayor of Iville, a town of 500 people near the city of Rouen, told Macron. "We feel isolated and yet we're only 160 kilometres (100 miles) from Paris," said Jean-Noel Montier, mayor of Mesnil-en-Ouche, which groups several remote villages. Macron, a former investment banker who previously never held elected office, won the presidency in 2017 on a promise of reform and democratic renewal. He is hoping that returning to the sort of participative democracy he championed during his campaign will take the heat out of the yellow vest revolt. Security was tight for Macron's visit in Grand Bourgtheroulde, a town of 3,500 people near Rouen where a yellow vest demonstration ended in clashes with police on Saturday. Police used tear gas to disperse a few hundred protesters, many in yellow vests, who lined the road outside Grand Bourgtheroulde as Macron's motorcade arrived. "Macron, resign!" some in the crowd chanted. Five yellow vest representatives met earlier with junior environment minister Emmanuelle Wargon, who has been charged with coordinating the debates along with local government minister Sebastien Lecornu. Tuesday's meeting sounded the start of two months of consultations across France on four main themes: taxation; France's transition to a low-carbon economy; democracy and citizenship, and the functioning of the state and public services. In an open letter to the French on Sunday listing 35 questions for debate, Macron said he hoped "as many as possible" would participate in the townhall-style discussions. "We won't agree on everything, that's normal, that's democracy. But at least we'll show we are a people who are not afraid to talk, exchange and debate." Following the two-month debate, Macron said he would come up with a "new contract for the nation". Five independent auditors will be appointed to ensure the debates remain free of government interference. They point to the government's setting of red lines -- particularly its refusal to repeal a cut on wealth taxes for high earners -- as proof that it has already decided the outcome of the dialogue. Analysts and many in Macron's own party fear the consultations will spur a cascade of nebulous demands or calls for the repeal of longstanding laws, such as those that abolished the death penalty or allowed gay marriage. An Elabe poll Tuesday showed the French feeling lukewarm about the consultations, with 40 percent saying they intended to participate and 66 percent saying they did not think it would end the protests. The demonstrations began in mid-November over fuel tax increases seen as unfairly weighing on rural and small town inhabitants who depend on their cars for transport.